Google adsense is a pain in the behind lately. They banned a lot of publishers for different reasons but mostly invalid clicks. I was one of the unlucky one. I never received any e mail notification and was wondering what was my offense. Appealing is an option but seems useless. A lot of applicants are turned down many times. Being approved takes a lot of effort and re appeals until you give up and got pissed off. So if you are banned or turned down by Adsense, worry not. It is time to move on and get an alternative ads. There are a lot of legit sites to choose from, some pay less than Adsense but worth trying for. And besides being approved in some of the sites are not as painstaking as Adsense. When people search and click the link you will get paid. If you get click on the top paying keywords then you will definitely earn. Some high paying key words gives you $5 per click which is way better than adsense. They provide the maximum return from your traffic in comparison to other PPC. This stems from the simple fact that, for over six years now, they've worked tirelessly and diligently in the Pay-Per Click market. And since that time they've achieved both lasting and exclusive partnerships with numerous feed providers--providers that have supplied them with the highest rates in the industry. Chitika is a prtetty good option if you are banned at adsense.Adsense and Chitika are basically the same in many ways but Chitika is not so cruel as Adsense. Chitika ads are known in the industry for the ability to perform unlike any other by delivering the right ad to the right user at the right time - helping advertisers and publishers achieve the highest possible ROI. Aside from the PPC, you can earn extra income from referrals who join Chitika using our ID. Payments can be made ​​via PayPal. 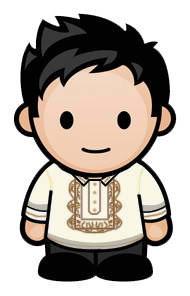 Nuffnang is the first Asia Pacific blog advertising community, with more than 100,000 Nuffnang bloggers in Asia Pacific. A blog advertising company that is very much like Google Adsense, except that Nuffnang only run their ads on blogs or websites. Other than allowing bloggers to serve ads from various advertisers, Nuffnang also focuses efforts on building the blogging communities in countries it has presence in with various events and activities for bloggers. 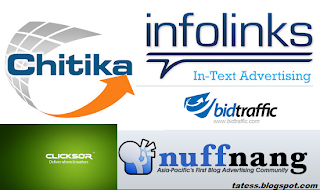 Infolinks is a text base ad network. It underlines keywords to trigger only the most relevant ads. That’s more income with less clutter on your site and don’t worry these hyperlinks aren not the backlinks. Infolinks was established on a simple premise: To provide engaged website audiences with advertisements that truly match their interests as they read. licksor is a contextual advertising network which functions by allowing advertisers to match pre-selected keywords or channels within particular internet content. The advertising formats include inline text links, banners, graphical and rich media banners and pop-under ads. Payment for these ads may be on a CPC, CPV or CPM basis. The minimum charge for advertisers is $20, and the minimum payout for web-content publishers is $50. Clicksor claims to be able to target via time-targeting and geographical targeting, in addition to their keyword based system. Luminate transform static images into interactive content. Their "first-of-a-kind" platform for image apps allows consumers to mouse over an image and explore layers of informational content. Luminate, Inc. (previously known as Pixazza, Inc.) is the worldwide leader in making images interactive serving more than 150 million users each month and 30 billion image views per year. Founded in 2008, with the vision to make every image on the web interactive, Luminate offers the world's first platform for image applications. Developed by technologists from Netscape and LiveOps, Luminate's platform combines Internet and crowdsourcing technology to deliver the optimal content relevant to online images. Luminate is a private company funded by August Capital, CMEA Capital, Google Ventures, Nokia Growth Partners and Shasta Ventures, with headquarters in Mountain View, CA. AdBrite is the largest independent ad exchange, reaching 300 million global unique visitors every month, including more than 150 million in the U.S. With site-level transparency and an open platform for data providers and real-time bidders to plug into, we maximize selection and control for advertisers and publishers. Leveraging first- and third-party audience data for advanced targeting is dead simple, and results can be closely monitored through our superior real-time reporting and analysis. They offer an entirely transparent marketplace, direct access to superior campaign data and analytics and ultimately, greater control over what matters most – results. They pay well and approved a site easily. Smowtion is a technology company specializing in the Ad-Network business.They are focused on developing products and solutions for the online advertising industry, helping them to target quality audiences.By combining behavioral, predictive and contextual targeting and inventory performance methods, we enable advertisers to reach their targeted audiences wherever they can be found (blogs, networks, searches and social networks). Smowtion also works with over 150,000 publishers worldwide, using the same optimization processes to help them obtain a higher eCPM and present visitors the most appropriate ads. I read some negative comment about Bidvertiser but still some recommends this a one of the alternative for Adsense. Ir is a Pay per click advertising - online advertising directly on sites of your choice, internet marketing solution for online advertisers and something .Simply display the BidVertiser ads on your website and let advertisers bid against each other. Bidvertiser On-Site Bid Per Click offers website owners with the ability to sell their ad space, automatically, to the highest bidder, on a price-per-click basis, where the price is mostly effected by the quality and popularity of their website. Advertisers can place ads directly on sites of their choice and pay only when a visitor clicks-through their site. Bidvertiser serves text ads in all types of standard ad units, including banners, buttons, skyscrapers and inline ads. Kontera's technology is based on several proprietary semantic, statistical, linguistic, and yield-maximization algorithms that analyze online content, extract and rank topics and keywords, and then match them to relevant advertisements, content, and information. The company's flagship product is called ContentLink. Kontera was founded in 2003 by co-founders Yoav Shaham, Assaf Henkin, and Henit Vitos. The company is privately held and backed by Sequoia Capital and Carmel Ventures. Kontera is based in San Francisco, with offices in New York City and Herzliya, Israel. PocketCents Inc. was founded to provide an alternative online advertising solution that focuses on providing the best possible advertising network for both the publishers and the advertisers looking for the most profit through advertising.The PocketCents pay per click banner advertising network is built from the ground up to focus on the most important aspects of internet marketing. Target markets of your industry at fixed PPC rates! Choose a local audience to place your advertisement in front of and invest in solid results. Exit Junction is your Innovative, non-Intrusive, exit-traffic monetization solution! Join the ExitJunction program and gain access to all the necessary tools needed for you to make money from your exit traffic. Earn high eCPM rates!You can get paid for serving invisible ads! Your site ad space remains untouched and you can continue using your current ad-providers on your site, except now you will have an additional revenue stream! ExitJunction is the only program that monetizes 100% of your traffic. That's right! You get paid even for your international traffic! Whether you have traffic from the United States, Australia, China or India, ExitJunction will pay for it all. ExitJunction ads can appear on the same page as Google Adsense since they are not contextual and do not resemble Google AdSense. BuySellAds is one of the best alternative to Google AdSense but but getting approved into the program is not easy .You have got to have a certain amount of impression and unique visitors daily in order to get approve. Earning is not that easy too, you will find an advertiser based on the ammount of impression you get. BSA started for one reason: to make buying and selling ads incredibly easy. And we do. But since then, we've evolved to mean much more for publishers and advertisers alike. We operate one of the largest advertising marketplaces on the Web, serving well over 6 billion ad impressions each month. Our approach is unique, genuine, and transparent — that's why thousands of advertisers and publishers love doing business with us. It's just so easy. DynamicOxygen is an online technology company with a mission to disrupt the current search-advertising market. The company is completely technology driven and are obsessed with constantly improving product offerings and build products based on customer feedback and requests. They believe in cutting edge innovation and rapid product development. No task is too big and no goal is unachievable for them. They believe in making a difference by building new products that shift the balance of power in the online advertising market. They are passionate about technology and strongly believe in the value proposition they provide for advertisers and publishers. Nice work bro. Great alternatives. No more licking of google's feet for approval after banishment. I'm a membet of some of these sites but haven't really been into them...will spend some time learning and tweaking my accounts....thanks for the other platforms you listed, will ne really helpful! Thanks for these info, I am one of the unlucky publisher of Adsense.. banned several times na! Will try Chitika.. thanks again! great! will check these ad service. I have tried chitika and adbrite but deleted them both. Chitika It is difficult to generate clicks with the links they are providing it's too general. for adbrite i find their ads too bold, too bright, too flashy.. I have tried chitika before but the earnings is too slow they only give compensation to US traffic so I stop, while clicksor I just don't like it, madaming links sa blog. I am very happy there are alternatives to adsense. Affiliate ads are so important. Thank you for doing the work and helping us find alternatives! among all of these advertisers...i liked the most is adsense,only coz of its analytics.i tried to get an account for buysell,but they didn't approved my request.Technoratimedia Publishers(technoratimedia.com/publishers/) is another good one to choose..but bit difficult to get an account.Tess you try to add some Ad-publishers for coding-websites in your article. HI, this is Pamela from Infolinks. We're a fantastic alternative to AdSense, as we offer the highest payouts in the industry. We provide relevant In-Text ads as well as several other products designed to monetize your site! Check us out at www.infolinks.com. I've heard of the others but this is the first time I've heard of Bidtraffic. Might just try it out. i am now using clicksor in one blog and other use smowtion and alternate them with adsense using an alternate ad plugin.. i do not have idea on some of this.. thanks for sharing will try and get to know all you mentioned. Thanks for this. Are this alternatives legit? Wow! This is nice. I have actually no idea on these. Haha! Wil do my own research in the next coming days. Nice compilation, there Ma'am Tess though if you provided the links (with you as referrer in the sites you joined), it would've been nice too. Had nuffnang and my adsense is pending approval, it's nice to know that there's a lot of alternatives for ads. Thanks! My first account with Adsense was banned so I made another one. But now, I'm beginning to like Nuffnang. I already have Nuffnang. I used to have Infolinks on my old blog but it did not earn any cent. I wonder if it will work on my new blog. I am also thinking if I should add Bidvertiser but I already have Google Adsense. i am afraid Google may ban my site if I do. I hate too many ads. If you have so many ads they distract readers and force them to shy away from your page, so I only have nuffnang and infolinks. I have Nuffnang and Google Adsense, though I haven't really gotten anything from them. Will definitely try these other alternatives. Thanks for sharing. This is very useful info. Never heard of most of these programs so I will give the no.1 a go! 5USD for every click seems too high. To be honest, most of what is listed above are strangers to my blog and even to my self....my blog does not earn a revenue though except adsense na ang liit masyado...my blog earns from sponsored and paid post that I receive through mails. I guess I will have to try these...Thanks a lot! Great list you have here although, in my years of blogging, I haven't got any cashout yet LOL! I have tried most of them and as an assessment, Adsense, Infolinks and Nuffnang are my faves. I'm interested to know, which one(s) would you actually recommend. Request lang, I hope you can also feature a list of good affiliate marketing programs. TIA. As far as I've tried. Nothing compares to google adsense though. 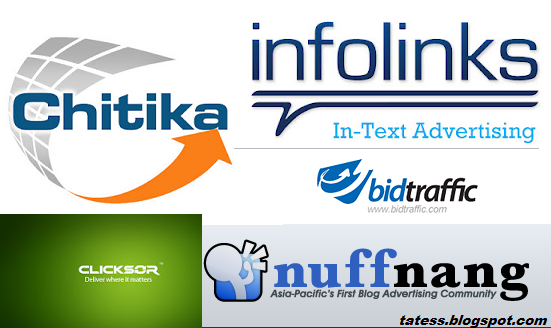 im using infolink along with adsense, dami pa palang iba pang alternatives. thanks for the info for each. alin po ba ang di conflict sa adsense? Yahweh bless. Thanks for this info...Will try some of them! Thanks again! Is Bidtraffic for US sites only? They'd ask for your USA TaxID/SSN. Can someone help? no,they are not for US residence only.You can add any number to SSN. just don't leave it blank .ai have SSN but I did not put it there .i just added any number. I like Pay Per Post.. Is their any Pay Per Post ads? Tanong lng po ma'am Tess. Kapag na banned ang aking accound sa google adsense mawawala rn ba ang aking account sa gopogle? isa lng kasi ang gamit ko na google account. same lng ang account ko sa Blogger at Google ads.. I am using an affiliate network that pays PPC as well. In this competitive world of online business a sound knowledge of SEO(Search Engine Optimization) gives the companies a definite edge over its rivals.I just started with Adsense.But ia m not satisfied with the revenue ia m genrating... can you suggeest me some SEO approches how i can improve my revenue? I heard lots of rants be it online or not about this Google Adsense thing. Good news is that there are lots of alternatives and some are kind of way better I surmise. I haven't tried anything yet but this is a good post. I am considering right now these alternatives that I once thought didn't exist. Thanks! "This web page at chikita.com has been reported as an attack page and has been blocked based on your security preferences." will see if i will join any of this..thanks for sharing! good resource for me! thanks! - bookmarking this! These ad networks are great but I don't think that all these comparable to Adsense. Google Adsense is different than others. Good post on google adsense alternatives, many people are getting banned from google adsense a/c, for them it is a great relief. They can try a few of the above available alternatives. I am not sure but I notice that getting accepted to infolinks program has become very hard nowadays. I applied and got rejected many times. I don't have any idea what's missing or lacking in my blog that I deserve such rejection. If only I could remember my old infolinks account, I had never bothered to apply with a new account again. I now use Chitika. It's great but I wish they had image ad available. im using google adsence..but iwant to find alternative for my website..thanks for sharing.. I used this 3 ads (adsense, chitika, and infolinks) you can use it all together. without banning or suspended in their TOS. I really dislike Infolinks. I think the way it selects keywords to underline is intrusive and does the article no favors as the post then becomes "ugly". Nice list you have here and I think I'm gonna try some of those instead of adsense alone. yes google adsense banned me also..
Nice list and I also had those in my blog but still I'm earning cents for now. nice list , i found some good alternatives. Thank's for information n' Thank's for sharing !!! Very helpful. But do you think their ads is good for our blog? I mean, does it contains malware or something that may harm our readers? I am new to blogging and my blog is still on its 3rd month. but I am looking forward to join this adsense alternative. umaabot ba ng $1 ang CPM rate dito sa pilipinas?? - magkano ang range, average ng CPM rate dito sa Pilipinas? ?